So it got me thinking, what are you going to do with your new kitchen toys in the new year? Even better, what resources would you recommend to people with these tools? I’ll get it started here. My sister-in-law and her fiancee just got a new ice cream maker, and my first thought was, Well, you’ve got to get The Perfect Scoop by David Lebovitz, and check out his blog. Make his salted butter caramel ice cream, which is ridiculously good. So here are a few other thoughts. Did you get any of this stuff? Let me know what resources you’d add (websites, blogs, cookbooks, iPad apps). Pressure cooker. See Dave Arnold’s (of Cooking Issues blog) posts on pressure cooked stock (post 1, post 2) for a fascinating explanation for what’s actually going inside your pressure cooker, and for tasting notes on different stock-making techniques. Also, read about how to rewire/hack your own to have more control over the internal temperature (if you’re comfortable playing with wires and solder and voiding your warranty — see safety disclaimer at the top of Dave’s post). Everyone makes beans in their pressure cooker, but you can also make great quick pork stock while softening up your pigs’ ears before frying! Sous vide machine. Man, a lot of options here, but all theoretical for me, since I don’t have one yet. My brother-in-law Rob got one, so I’m going to live/cook vicariously through him. One of the first things I’d try would be David Chang’s 48 hour short ribs from the Momofuku cookbook (read my earlier musings on that recipe here). Meat grinder. Awesome. Keep all your stuff cold, and grind away. Check Hank Shaw’s sausage primer on Simply Recipes and Ruhlman’s video post for excellent tips on making sausage. Both very useful when starting out, and they also have great recipes. People don’t realize how easy making sausage is. You don’t have to tell them. You should also read Matthew Amster-Burton’s Hungry Monkey, especially the chapter “The Monkey and the Meat Grinder,” which is terrific. the kitchen. 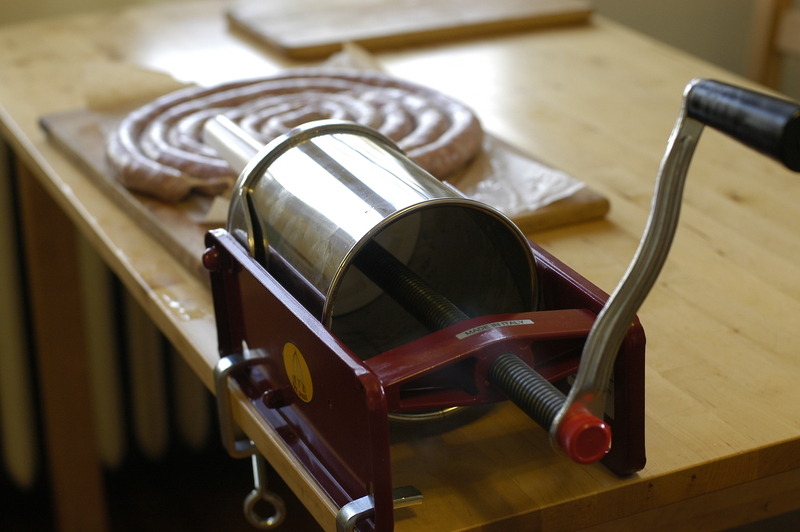 It turns the least pleasant part about making sausage into a breeze. You’ll need casings, which you can get from Butcher-Packer, sausagemaker.com, and probably from your meat counter if they make their own sausages in-house. Pickling crock. My mom has one of these that she keeps potatoes in. I’m trying to barter for it so that it can fulfill it’s true purpose! Check out Culinaria Eugenius’s posts on pickling of all kinds, and Punk Domestics’s always-helpful pages on pickling. Blast chiller. Hey, who knows what Santa brought you. But if he happened to get you one of these, here are some suggestions from Alex and Aki at Ideas in Food on how they use theirs. Note: they are thorough, helpful, and innovative resources for just about all of these tools, and not just for what to do with your new blast chiller. update (8:30 pm 1-1-12): Other things to consider are starting to fall into two categories in my brain: tools and appliances. Thoughts on these? This entry was posted in baking, cure, equipment, general, pork, pressure cooker, technique and tagged cooking, kitchen tools, pickles, pressure cooker, sausage. Bookmark the permalink.